Looking for pizza restaurants in Derbyshire to treat the family this May half term? Enjoy an authentic taste of Italy in every bite with our home cooked pizzas that are served daily at Littleover Lodge, along with a fantastic deal that you simply won’t want to miss out on! Freshly prepared using locally sourced ingredients and cooked to perfection in our stone baked pizza oven for a truly scrumptious taste, our pizza selection is perfect for the whole family! We have a range of toppings to choose from including traditional pizzas and pizzas with a unique twist – we guarantee that you won’t find a more diverse range of toppings anywhere else! So sit back, relax, and unwind in pizza heaven at Littleover Lodge this May half term! There are no other pizza restaurants in Derbyshire quite like Littleover Lodge. With beautiful soundings, mouth-watering food, affordable prices and live music on selected evenings, we offer a unique family friendly atmosphere that is perfect for a sunny bank holiday weekend or for the May half term. If you’re looking to take the whole family out over the holidays, why not check out our May half term deal? For just £20.00 you can feed 4 on 1x garlic bread, 2x large pizzas and 2x side orders. Our meal deal is available 4pm-6pm Monday to Thursday, 2pm-5pm every Friday and 12-5pm every Saturday! By choosing us out of all the other pizza restaurants in Derbyshire, you’re promised a friendly service that caters for all your needs, along with an atmosphere that welcomes all ages. Simply come along and try some of our unique pizzas such as the fiery volcano, the lodge pride, and many more for an exciting dining experience. Got a sweet tooth? 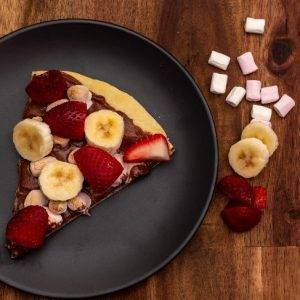 Then we’ve got you covered with a Nutella pizza topped with juicy strawberries or bananas… This is a chocolate lovers dream and is just the treat you need to see you through the week! Part of three pizza restaurants in Derbyshire from the JC Hotels family, Littleover Lodge is a must place to visit this half term, or for if you’re simply passing through Derbyshire this summer. To find out more about our other food menus or to book a table, please get in touch with our friendly team today!